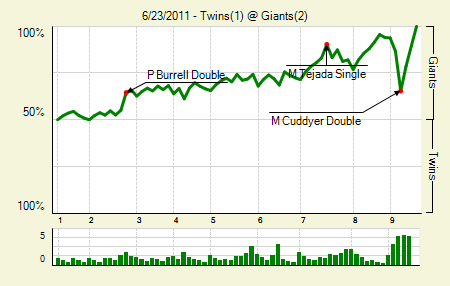 Moving the Needle: Michael Cuddyer gives the Twins a fighting chance in the ninth with an RBI double, +.212 WPA. The Twins were getting absolutely nothing done off Tim Lincecum, but they finally broke through against closer Brian Wilson. Alexi Casilla walked to start the inning, and Cuddyer whaled a double into the left-center field gap, his third hit of the day. The hit scored Casilla and put the tying run in scoring position with none out. 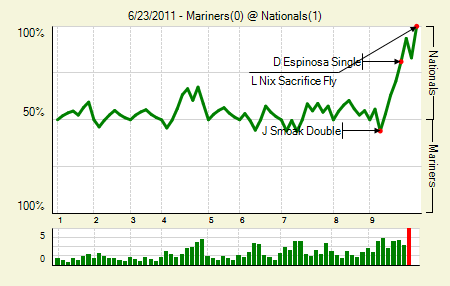 But Wilson took over from there, striking out Delmon Young before getting a fly out and a ground out to end the game. Tim Lincecum: 7 IP, 3 H, 0 R, 2 BB, 12 K. That’s his third start of the season with at least 12 strikeouts. Brian Duensing: 6.2 IP, 6 H, 1 R, 2 BB, 5 K. It was a valiant effort, but when Timmy’s on you need to be perfect as well in order to match him inning-for-inning. 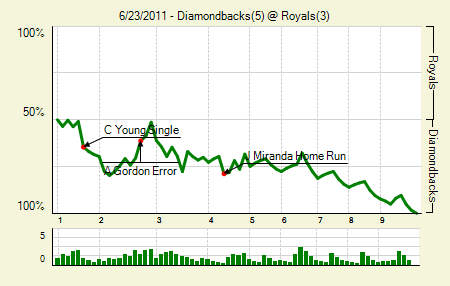 Moving the Needle: Chris Young singles home a pair in the first, +.137 WPA. After taking the first two games of the series the Diamonbacks struck early in their sweep attempt. A leadoff single and a hit by pitch put two men on for Young, who lined one into left. The single scored both runners, though Young himself was thrown out trying to sneak into second. If not for that the WPA swing would have been quite a bit more significant. A pair of homers aided Arizona’s successful sweep. Stephen Drew: 2 for 4, 1 2B. He drove in a run with the double. The gap power is certainly there this year, but he hasn’t been popping over the fence as he did last year. He has just one homer in the past month. Moving the Needle: Laynce Nix walks off with a sac fly, +.169 WPA. It was a 0-0 game through eight, and the Mariners threatened with a runner on second and one out in the top of the ninth. But Tyler Clippard worked out of the jam and handed it over to the middle of the order. Mike Morse started the inning with a single, and then Danny Espinosa ended up bunting for a single when he merely tried to sacrifice Morse to second. Ivan Rodriguez, too, tried the sac bunt, and he also reached (though it was ruled a fielder’s choice, because Justin Smoak made the look to third). It took a spectacular stop and throw to home by Jack Wilson to save the winning run from scoring, but the next batter, Nix, lined one into left. Morse took off for home, and the throw was way off line. Ballgame. Jason Marquis: 8 IP, 3 H, 0 R, 3 BB, 4 K. He had a no-hitter through 5.1, but it was broken up by Pineda. I can’t imagine the frustration of having a no-no broken up by an American League pitcher. Michael Pineda: 7 IP, 4 H, 0 R, 1 BB, 9 K. He was at just 97 pitches, but his spot came up first in the eighth causing Eric Wedge to pinch hit for him. He threw 70 of those 97 pitches for strikes. 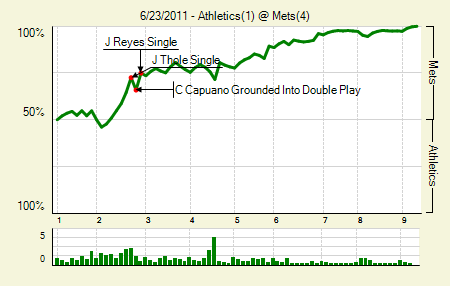 Moving the Needle: Jose Reyes extends the lead, +.091 WPA. If you’re going to score a run on a bases loaded double play with none out, you damn well better get that runner from third home as well. Three straight singles to open up the second brought Chris Capuano to the plate, and he hit one to Weeks at second, starting the 4-6-3 trick. Reyes did his part by bouncing one up the middle to score the runner, making it 2-0. Reyes had an RBI single later in the game to give the Mets a 4-0 lead. Chris Capuano: 6 IP, 5 H, 0 R, 0 BB, 7 K. Considering what the Mets signed him for and the expectations he brought, he’s done a fine job this season. Daniel Murphy: 3 for 4. In a game when the winning team has no extra base hits, the man with three singles wins. One of those singles brought home a run. Moving the Needle: Ryan Theriot’s two-RBI single gives the Cards a 4-0 lead, +.116 WPA. The Cardinals got started early against Roy Oswalt, who left the game after the second with back issues — potentially career-threatening back issues. With runners on second and third with two outs in the second, Theriot hit a hot shot up the middle, scoring both runners. 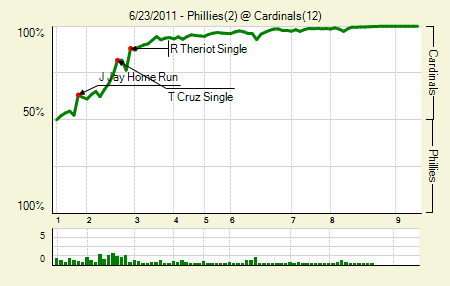 The Cardinals would then tack on plenty, paying back the Phillies for the first two games of the series. Lance Berkman: 2 for 5, 1 HR. His three-run shot capped the scoring at 12. Matt Holliday: 2 for 4, 1 2B, 1 BB. The top three hitters in the order each drove in a pair. Chris Carpenter: 7 IP, 5 H, 1 R, 1 BB, 7 K. That’s a nice bounce back after allowing five runs in each of his previous two starts. We hoped you liked reading The Morning After: Game Recaps for June 23rd by Joe Pawlikowski! Nitpick: Espinosa scored the winning run, not Morse. Morse got thrown out at home on the previous play. PR Brian Bixler was thrown out at home, he ran for Morse after Morse got to 2nd.